We’re mighty excited to announce that Visual Website Optimizer now supports testing and optimization for mobile enabled and responsive websites. Just in time for the holidays shopping spree, subscribers of the VWO “Large Agency” plan and above can now optimize their mobile landing pages and websites just as they would do for their desktop visitors. 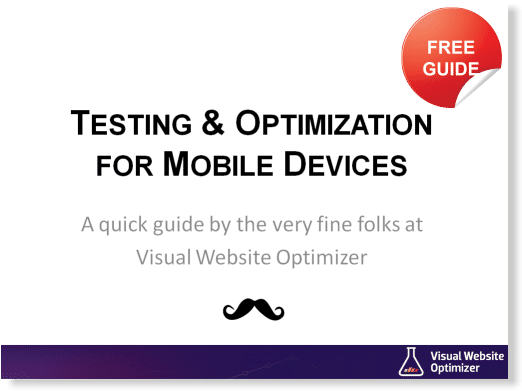 Visual Website Optimizer currently supports A/B and Multivariate testing along with behavioral targeting for Android smartphones, iPhone, iPad and Windows Phone devices. We’ve also created a handy guide (PDF) that has a quick coverage of industry trends, tips and tricks you can use while setting up your mobile website and additional resources to get you started. Mobile eCommerce has been exploding in recent years. The accessibility that a portable small device offers is unmatched by large computers that cannot be opened and used just about anywhere. More importantly, the convenience provided by smartphones and tablets means consumers are increasingly using them to research and check out goods they want to buy and even purchasing things on mobile devices. eMarketer estimates that mCommerce sales will increase by 362.69% by 2015 when compared to 2011 levels. As the adoption of smartphones and tablets continues, it is fairly certain that they will soon take up a considerable chunk of the eCommerce pie. In many markets, they’re already seen as viable, secure methods to carry cash and make purchases on the go. Since the customer is increasingly going to shift to mCommerce in the future, sellers of products and services need to ensure that not only are actively available to communicate with them on the mobile web, but are geared to make the best use of the medium. And one way for eCommerce players to increase their sales and conversions is to regularly A/B test their web pages, ensuring that the minimum possible number of potential customers fall through the cracks. Anticipating the impending expansion of eCommerce players into the mobile web, we at Wingify have been working for the past few months on A/B, Split and Multivariate testing for mobile web pages. The feature is now live and is ready to help you optimize your mobile landing pages and websites to convert at a better rate. Here is a screenshot of Mobile A/B testing with Visual Website Optimizer (click on the image to see larger version). This feature is available for all VWO Large Agency plans and above. Download our easily digestible Mobile A/B testing guide. It’s filled with tips and tricks to help you create higher converting responsive websites. We hope this new feature helps you optimize conversion rates for your mobile enabled, responsive designs. Great news! We just started implementing VWO for testing our mobile site, but had found that results were understated by 50-60% in all cases. We hypothesized that this was due to VWO scripts not having a chance to fully load and trigger the event/visit. Has this new push dropped the load time needed to register a trigger/visit? Daniel, the current push will not have any impact on the load times. However, we have pushed an updated recently (https://vwo.com/blog/geo-distributed-architecture/) that should reduce the load times. We are also in the process of making more changes in the system to ensure these issues are ironed out completely. Please let us know more details about the issue via email and I will be happy to answer more specific questions you might have. Happy to see Mobile testing! There is a lot of demand for it, and it makes perfect sense as more users use mobile sites, yet many companies do not provide a great user experience for mobile visitors. Playing catchup is never a good strategy, so we will be advising our clients to be proactive and test test test, mobile and all. Thanks VWO for providing this update! When will this be available for Small Agency? Right now it’s only available for Large Agencies and above. No plans yet to introduce this for Small Agencies.